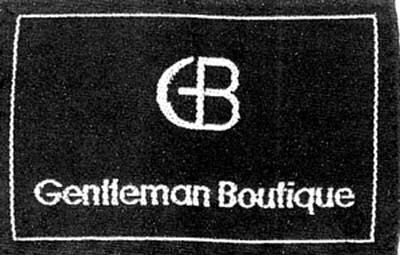 Home › Intellectual Property › Gentleman Boutique – a Black Mark Against the Opposer for Trying to Bend Civil Procedure. Gentleman Boutique – a Black Mark Against the Opposer for Trying to Bend Civil Procedure. G.B. CHASSIDIC CLOTHING LTD filed Israel Trademark Application No. 233272 for GB Gentleman Boutique. The mark is depicted above. We suspect that the black background is not coincidental. A Mr Abraham Berman, represented by Adv. Yoav Ma”Zeh opposed the registration. At that stage, Applicant turned to Soroker Agmon too represent them. Berman requested filing an additional affidavit as evidence, after the other witnesses had testified and had been cross-examined. he argued that he had not originally filed an affidavit as he wasn’t sure that he would have been in the country and available to testify. Applicant’s objected to request to file additional evidence, and argued that it would merely spin out the proceedings, and that the affidavit did not add anything new. It was also against standard procedures to do so at the stage of summing up. In her ruling, Deputy Commissioner, Ms Jaqueline Bracha acknowledged that she had the authority to allow standard procedures to be over-ruled, and could accept the testimony. However, unlike in previous cases where new evidence became available at a late stage, in this instance, the opposer could have filed his affidavit with the other evidence, and, in the event of being unavailable to testify, for reasons of being out of the country, he could have withdrawn the affidavit if necessary. Ms Bracha therefore refused to allow the testimony to be admitted which would draw out proceedings and waste valuable court time. She gave the opposer 45 days to present his summing up arguments on no more than 15 pages with the standard spacing acceptable by the courts, after which, the applicant would have 45 days to submit their concluding remarks on 15 pages, with the opposer being granted a further 7 pages in 15 days to file a response to applicant’s remarks. We think three days per page (double spaced) is ample time for the attorneys of both sides to present their summaries. (Seven pages in 15 days, may be pushing it though). We note that Adv. Ma”Zeh is a lecturer in IP Law at ONO College by day. We hope that his lectures are arranged in a sensible order and content is delivered at appropriate times. How will his students feel if after a course summary lecture he then introduces new material?